Coal Production Map by region (2011 million short tons, % change from 2010). Source: Quarterly Coal Report, October- December 2011 (April 2012), U.S. Energy Information Administration (EIA). Coal is a solid with a high carbon content and a low hydrogen content, typically only 5%. The cost of coal mining is going up, production is declining in the Appalachian region and shifting to the Powder River Basin where it’s cheaper to mine and the coal is lower in sulfur. Factors such as geology and the rising costs of complying with a variety of new regulations, transportation, explosives and wages are making coal mining more expensive. Appalachian coal has been facing a structural decline as its mine seams have become thinner, more difficult to mine and less productive. Western region mines over half of the coal produced in the United States and has some of the largest coal deposits in the world in the Powder River Basin in northeast Wyoming and southeast Montana. Coal mining in the United States is a major industry, which peaked in 2008 at 1.2 billion short tons. Coal production is highly localized and depends on having access to a full network of services, transport and power plants. Coal accounts for approximately 45% of railroad carloads and 25% of the annual revenues of freight rail Class I companies (Association of American Railroads, 2011). Trucks are often the quickest and easiest way to move coal and can easily be scaled up or down. They are used in shorter hauling, moving smaller quantities, and access to loading points to nearby electric and industrial plants. Barges only move coal from mines that have access to the U.S. river system. They are slower but more cost effective and fuel efficient. 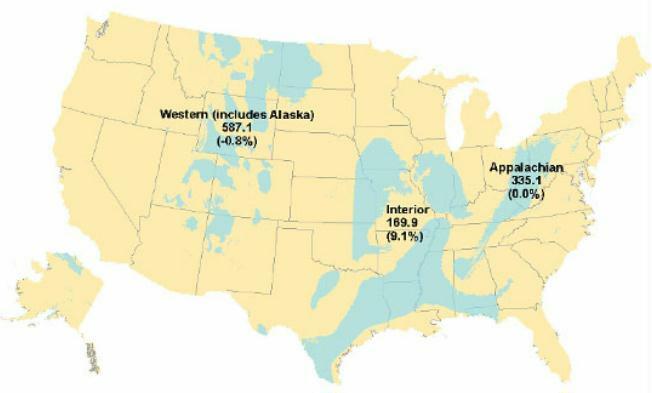 About 20% of the coal used in U.S. electricity generation travels by inland waterways. Many coal companies use a multimodal delivery system that includes rail (short and long haul), trucks, railcars and barges. Coal transportation cost, especially in the west, can exceed mining cost (EIA 2012). Northern Appalachia coal, rated at 13,000 Btu per pound, is the highest quality, while Powder River Basin coal (from Wyoming and other Rocky Mountain states) is the lowest quality, with a rating of just 8,800 Btu per pound. What’s it good for besides electricity? The steel industry is the second largest user of coal and coal by-products to make steel for automobiles, bridges and buildings (Spiegel, 2006). Nearly 70% of global steel production depends on coal (Ernst & Young, 2011). Other coal users include concrete, cement, aluminum, paper, chemical, wood and roofing companies. Coal gas by-products such as methanol and ethylene are used to make products such as plastics, medicines, fertilizers and tar. Full-scale carbon capture, utilization, and storage (CCS) technology has yet to be demonstrated in practice or proven to be commercially acceptable for coal-power- generating units due to significant technology, financial and regulatory challenges. Coal gasification and liquefaction technologies have been known for some time. Their products can range from transportation fuels and gases to valuable chemicals that can be used in the industrial gas, fertilizer, plastics, rubber and various other industries. Europe faces a dilemma. Indigenous oil and gas reserves are limited; supplies are increasingly dependent on imports; prices are uncertain, but likely to fluctuate wildly, and [Russia] shows a willingness to use its oil and gas for political purposes. Thus, there is a strategic need for the EU to establish stable fuel supplies. From this strategic perspective, the only primary fuel (apart from nuclear) which has the capacity and the infrastructure to meet this stability requirement is coal. Unlike oil and gas, coal is geographically widely distributed, with many countries trading it, limiting odds of a monopoly supply situation. Also, international trade represents less than 15% of total world production. Because of its large reserves, the price is likely to be more predictable than that of either oil or gas. CTL plants will be expensive to build and expensive to run. Therefore, it will only be deemed worthwhile proceeding if concerns about the security of oil and gas supplies are such that substitute oil products via CTL can provide a level of reassurance at a price that is deemed worth paying. As with all ‘insurance policies’, this will always seem unnecessary until it is actually needed. Under-investment or failure to pay the premiums will mean that benefits will not be paid out when they are needed. CTL is capital-intensive and benefits substantially from economies of scale. Most studies on process economics have assumed that a full-scale commercial plant would produce 50,000-100,000 barrels/day of liquid products (DTI 1999). Such a plant would process 15,000-35,000 metric tons/day of bituminous coal or up to double that amount of sub-bituminous coal or lignite. To be worthwhile, 400 million metric tons over the project lifetime ned to be consumed. It’s likely that an 80,000 barrel/day plant would cost $5-6 billion US dollars with annual operating costs of $250 million (Kelly). A major pinch point for future fuel supplies is transport, for which demand shows no real sign of abating, with a continuing and expanding need for liquid fuels. The uncertainties in oil supply will continue to impact heavily on the transport sector, where no clearly viable alternative has yet been identified (not least since both biofuels and hydrogen involve significant use of fossil fuels). Consequently, the production of liquid fuels from coal offers a potentially attractive route to meeting this requirement, as one aspect of a balanced energy portfolio. This position is reflected in the rapid growth of interest in CTL worldwide, with major engineering projects now underway in China and detailed feasibility studies being undertaken in the USA, while South Africa continues to upgrade its CTL production capacity. In Europe, there is a corresponding upturn in interest, particularly in the former Soviet Union satellite countries that are now members of the EU, such as Poland, Estonia and the Czech Republic. The main quality parameter for coal is the carbon/energy content and so the logistics chains differ for hard coals and low rank coals. Global transportation of hard coals and some sub-bituminous coals is commercially worthwhile, while lower-grade coals (e.g. lignites and those with high impurity contents) must be used close to the coalfield as it is not economically viable to transport such coals any significant distance. Coal is a solid with a high carbon content and a low hydrogen content, typically only 5%. Transport fuels (gasoline/petrol, diesel and jet fuel) are currently derived overwhelmingly from crude oil, which has about twice the hydrogen content of coal. For coal to replace oil, it must be converted to liquids with similar hydrogen contents to oil and with similar properties. This can be achieved by removing carbon or by adding hydrogen, either directly or indirectly, while reducing the molecular size. Also during the process, elements such as sulfur, nitrogen and oxygen must be largely eliminated. Thus, the technical challenge is to increase the hydrogen/carbon (H/C) ratio in the product, and to produce molecules with the appropriate range of boiling points. Hydrogen is also needed to reduce the oxygen, sulfur and nitrogen present. These are removed as H2O, H2S and NH3. A range of partially refined gasoline- and diesel-like products (as well as propane and butane) can be recovered from the synthetic crude by distillation. This provides a series of different temperature-range ‘cuts’, and each of the liquid products is made up of a mixture of different hydrocarbons appropriate to the boiling point range of the different components. These products tend to be highly aromatic, which can make them difficult to use as high quality transport fuels, although they can be rich in octane aromatics making a good gasoline substitute. Water usage. CTL plants require substantial amounts of water, probably in the range of 5 to 10 barrels for each barrel of liquid products. There are several major requirements for water in a liquefaction plant. 1) process water is needed for the steam feed to gasifiers to make up the hydrogen requirements, water for use in the liquefaction processes, and wash water for syngas cleaning. 2) steam may be required for the water-gas shift reaction; 3) boiler feed water is needed to produce steam, and in many cases for on-site power generation; 4) cooling water to remove heat at different stages, and in particular from the FT reactors where the highly exothermic reactions need careful temperature control. It is important to consider the influence of coal properties on technical aspects of plant operation. In this regard, the most important characteristic coal properties are particle size, water content, amount and composition of mineral matter, content of the sulfur, nitrogen and chlorine species in the organic coal matter. The required particle size of the feed coal depends mainly on the process characteristics. On one hand, the particle size has to be low enough to ensure stability of the coal oil slurry, because coarse particles favor sedimentation while the valves of the high pressure pumps are very sensitive to oversize particles. On the other hand too high a proportion of very fine solid material is not desirable as this enhances significantly the viscosity of the coal oil slurry which causes high pressure drops and decreases the heat transfer in the heat exchangers. A typical particle size for hard coal as feed material is <0.2 mm. The feed coal is usually dried in a combined drying and pulverizing step. A high residual moisture in the coal which cannot be further reduced is disadvantageous as the resulting steam reduces the hydrogen partial pressure in the reactor volume. For hard coals 0.5-2 wt.-% moisture contents are attainable whereas for lignite 5-10 wt.-% has to be accepted. The mineral matter of the feed coal is an inert burden in the process and should be as low as possible, since they occupy expensive high pressure reactor volume without a contribution to the oil yield. Furthermore, they cause erosive material damages to the valves. Sasol is seeking to build on its experience and expertise by looking for opportunities where substantial deposits of low cost (possibly low grade) coal would support a CTL plant producing around 80,000 bbl/d, thus taking advantage of the potential economies of scale. This approach, however, means that any individual project size requires the investment of very large amounts of capital (of the order of US$5-6 billion) so that government guarantees relating to the value of production or other long-term support would be needed. UCG has the potential to unlock vast amounts of previously inaccessible energy in unmineable coal resources. There are significant obstacles to be overcome before this is possible, many of which are associated with the fact that the process takes place deep underground in a context where it is difficult to monitor and control the conditions. Consequently, UCG requires a multi-disciplinary integration of knowledge from exploration, geology, hydrogeology, drilling, and of the chemistry and thermodynamics of gasification reactions in a cavity in a coal seam (Couch 2009). UCG has reached the stage of “proof of concept”, but different parts of the technology have been demonstrated/proved separately and each in unique circumstances. That said, the single most important decision that will determine the technical and economic performance of UCG is site selection. The field trials undertaken so far are grouped into two main categories, namely those conducted at shallow depths, some in thicker seams, and those at greater depth in thin seams. To date, all that has been established is that given the right conditions, coals of different rank can be gasified underground. Ultimately, it will require a series of successful demonstrations, building on what has already been established, in different geological settings to establish where UCG can be safely carried out cost effectively at a commercial scale and without environmental damage. IEA. 2009. Review of worldwide coal to liquids R, D&D activities and the need for further initiatives within Europe. International Energy Agency. Spiegel, C. 2006. Opportunities for Coal-Based Products: Clean Coal and Coal Processing Technologies. BCC Research: BCC Research.